There will be a job recruitment event in Bulacan on August 27,2015 at the 3rd Floor PESO Office, Baliwag Municipal Hall. 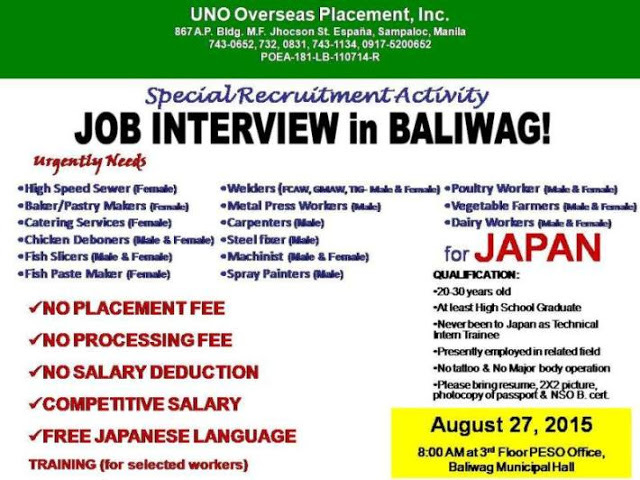 They have jobs for Bulakenyos who want to work in Japan. UNO Overseas Placement Incorporated, (Licensed Placement Agency) the agency behind this event, implements no placement fee, no processing fee, and no salary deduction for these job openings. Competitive salary awaits the newly hired workers. Selected workers will also receive free Japanese Language training. Manpower agency based in Manila, UNO Overseas Placement Incorporated will be in Baliwag and Malolos Bulacan, Philippines this coming August 27,2015. They will conduct the said recruitment event for their current job openings bound for Japan. Japan needs skilled workers which have previous work experience in metal works, carpentry, and spray painting. Japan also needs Filipino OFWs for catering services, chicken deboners, fish slicers, bakers, pastry chefs, poultry workers, dairy workers, and vegetable farmers. Job applicants should have NO tattoo. Job applicants should be at least high school graduate and never been to Japan as a technical intern trainee. Job applicants should be presently employed related to the position..
August 27,2015 at the 3rd Floor PESO Office, Baliwag Municipal Hall. The special event starts at 8:00AM. As of June 16,2015, UNO Overseas Placement Incorporated is an accredited POEA agency with license number POEA-181-LB-110714-R. License validity is up to November 3,2018. You can visit their website unooverseas.com. Call their office with these phone numbers: (632) 743-0652, (632) 732-0831.